As I pressed the last creamy silk supplemental weft into place with my Guatemalan pointed stick I was thinking “Okay, that’s enough brocade work for the time being!” I was just finishing the inlay part of the third of my three-panel wall hanging. The black central panel was the last one to be tackled and, in fact, this was my second attempt, the first having been set aside as a “valuable learning experience”. And, messing about with supplemental wefts brought with it lots of plain weave of the warp-faced variety. With that came the great coil rod adventure and the conquest of the dreaded corrugation, the circular warp experiments and the enjoyment of using fine thread. 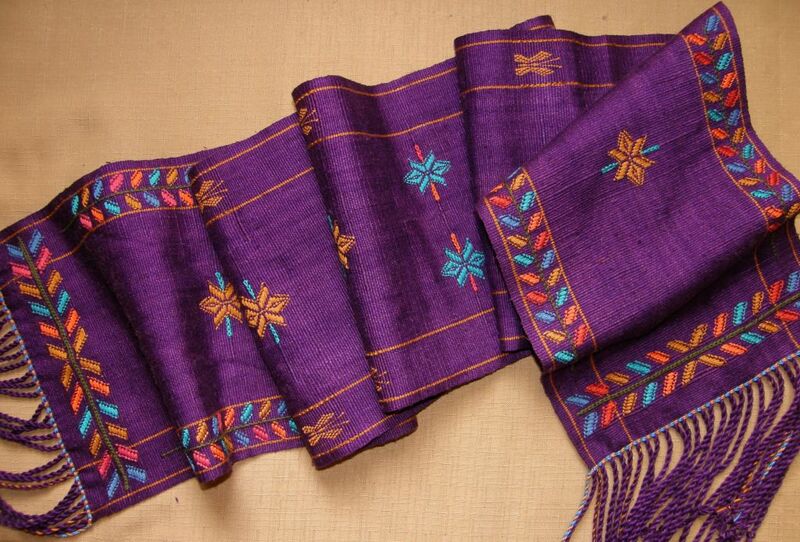 One of my students during the year told me about a weaving instructor who had urged her students to embrace the challenge of perfecting plain weave. I guess I unconsciously took on that challenge last year…not that I am saying that I have perfected it!! But, I have to admit that I just love the feel of the fine red plain-weave panels in the three-panel wall hanging, the lack of ridging and the evenness of the edges…no fancy floats…just lovely plain cloth. I am pleased that I chose to weave the panels separately. I want to have those red panels hanging freely to float and sway as they please. My bedroom floor says it all! There are certainly advantages to living alone. It allows me to make my bedroom floor my permanent project, ideas and drawing board. I just need to step between stuff anf fall into bed. And, who cares if you wake up at 3am and have the urge to sit amongst the stuff feeling suddenly creative? So, what’s on the drawing board? 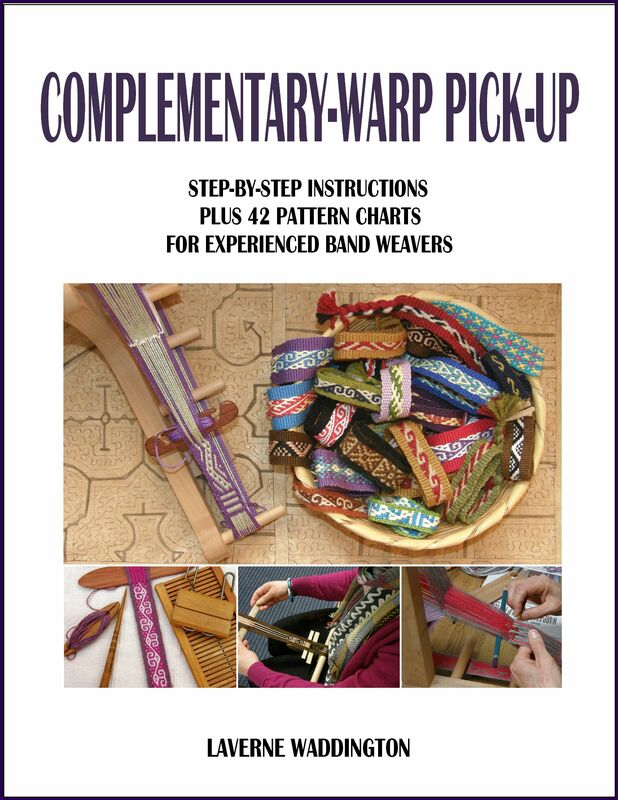 There are five projects there, three of which involve supplementary-weft patterning. Clearly I am not done with this and I am not done with seeking the perfect plain weave either. You can see the first “failed” brocade black panel in the lower right corner waiting to be made into something. Buttons and balls of thread stand by. 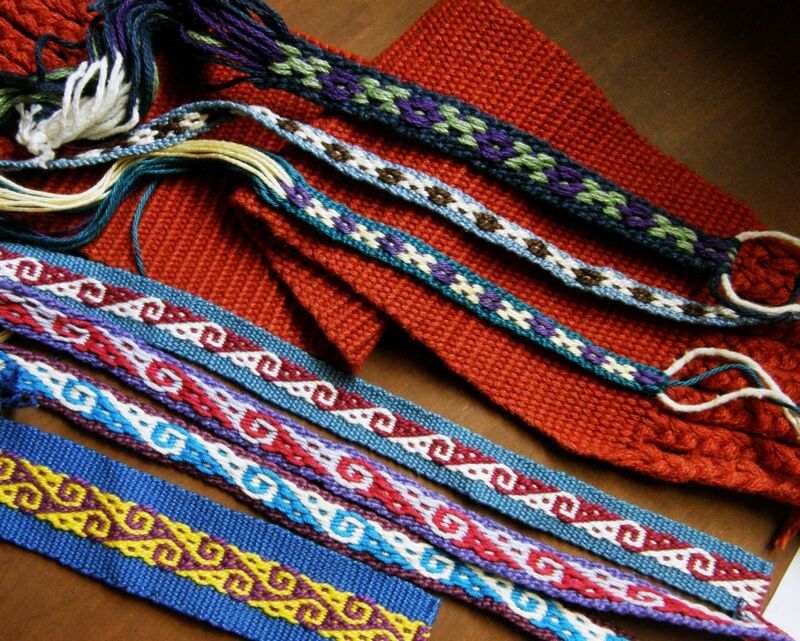 Then there’s the three-color pebble weave band stetched out that I wove last year (pictured above) which needs to adorn a bag. Meanwhile, two little piles of yarn have formed and are sitting there as the vague beginnings of two new projects. I want to make a scarf with my pale blue indigo-dyed Japanese silk. 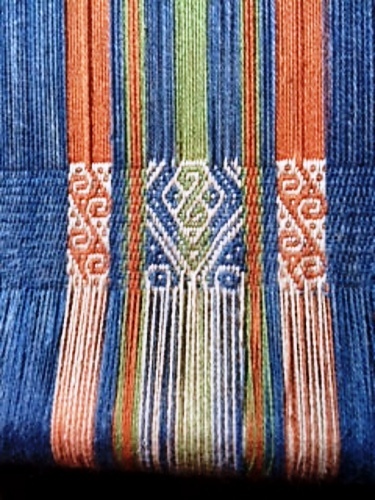 While I have used silk as a supplemental weft, I have not used it as warp (except for a tiny pebble weave experiment). I am hoping to start a silk-on-silk weft inlay project with that. The other project involves wool. 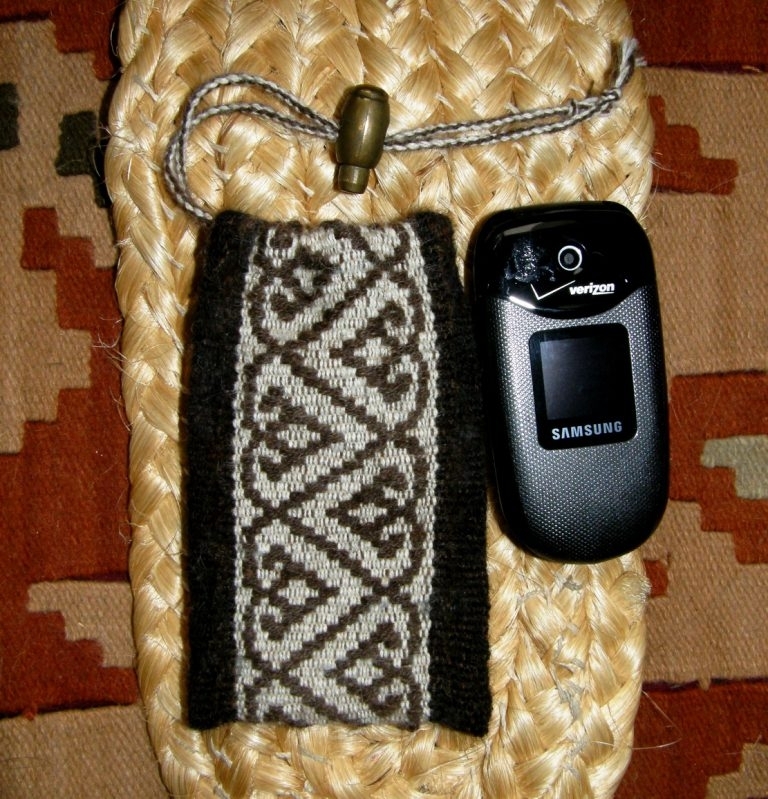 I was really happy to find how easily I could weave my sister-in-law’s cell phone pouch using wool straight off the skein. 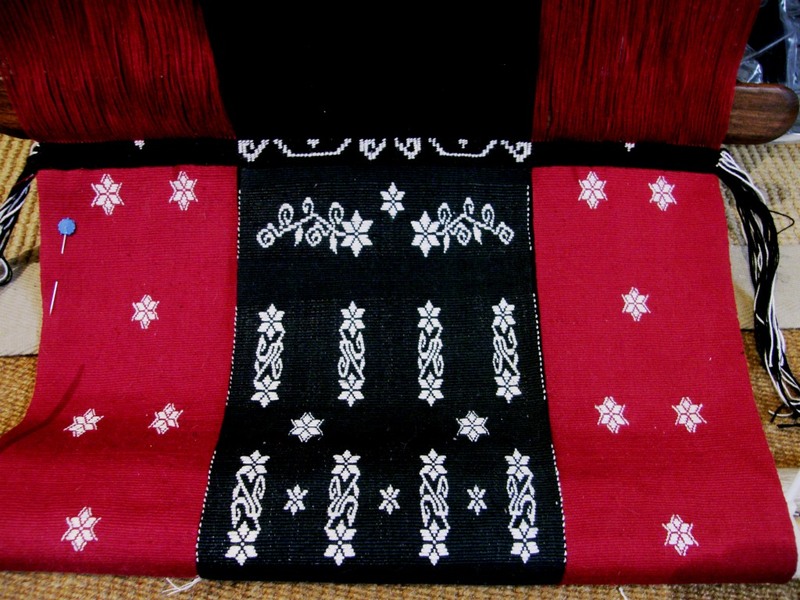 Re-spinning wool is generally recommended for warp-faced weaving so that the “tighter” fiber can better withstand the abrasion of the string heddles and the rubbing of the warps against each other. I didn’t re-spin, yet the wool I used behaved so beautifully. You do, however, need to have your shed opening technique down…smooth and gentle, no scraping or wrestling… to make his work. 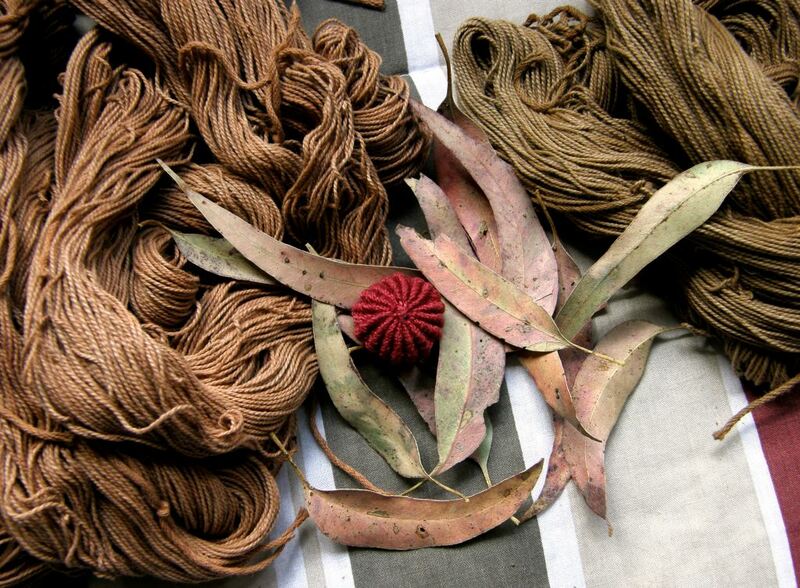 There’s the wee wool drawstring pouch at left (picture kindly taken by my brother after my departure from Australia. 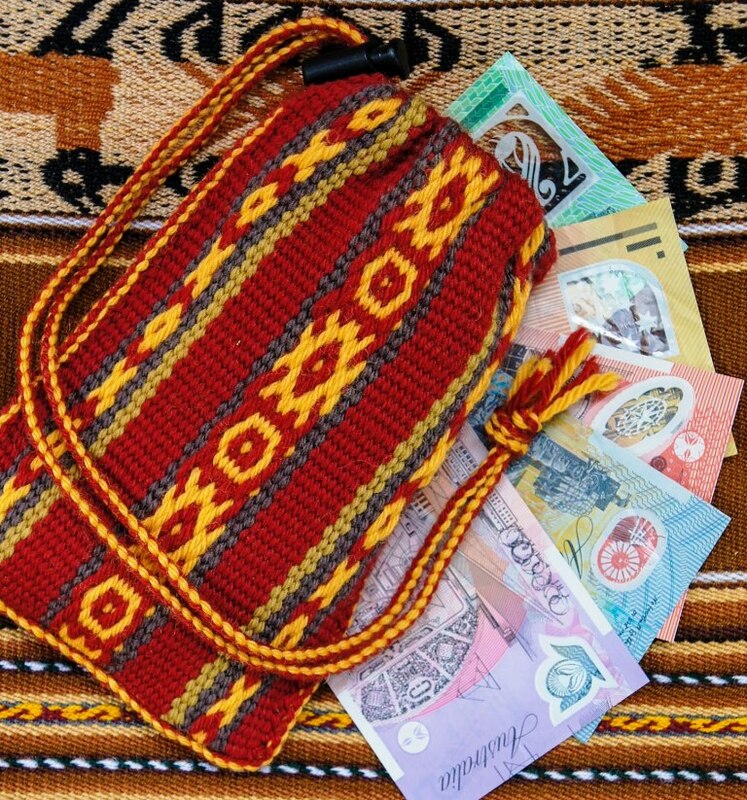 He photographed it with some of the pretty colored plastic money that we use in Australia). We really need to find a nice wooden toggle for the bag. The wool I am planning to use for the next project is finer and more loosely plied. I think it will be more difficult to work with …a challenge. Why don’t I just respin it? I don’t like the “hardness” of the resulting yarn or the curl that it gives to the finished pieces. 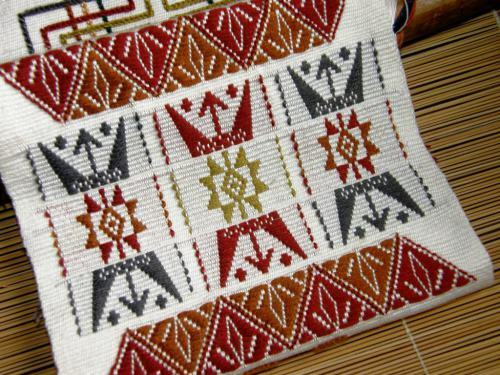 And guess what kind of patterning I want to do on this piece….weft inlay of course! Wool-on-wool. I made a small pouch a long time ago with left over odds and ends of alpaca that I had spun and decorated it with supplemental weft of the same alpaca. I love the way the alpaca supplementary weft billows out of the sheds to lie fluffy and full on the surface of the cloth. I know that wool will behave the same way. 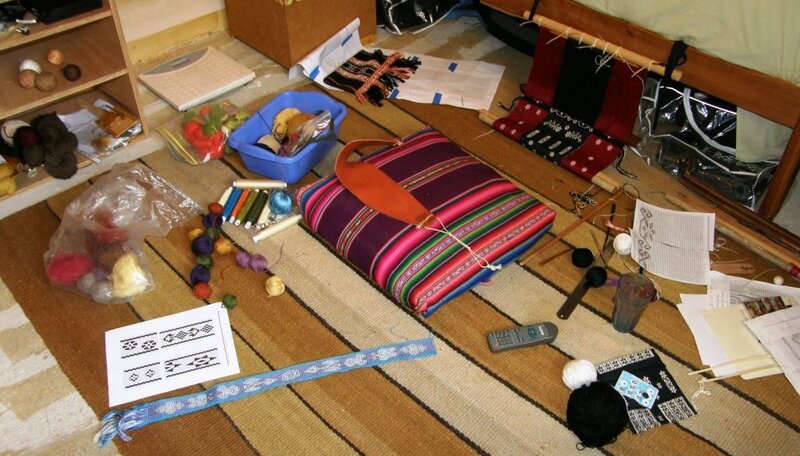 It seems there are endless possibilities for types of fiber to use for these inlay experiments. One thing I have not yet thought of using is hemp. Jennifer gave me some on one of my visits to Oregon and there it sits in the closet as yet untouched. Meanwhile Jennifer has been weaving with it and showed all of us in the Ravelry group her latest project…. The colors, which Jennifer dyed herself, are gorgeous. They have that sun bleached look that I so love. 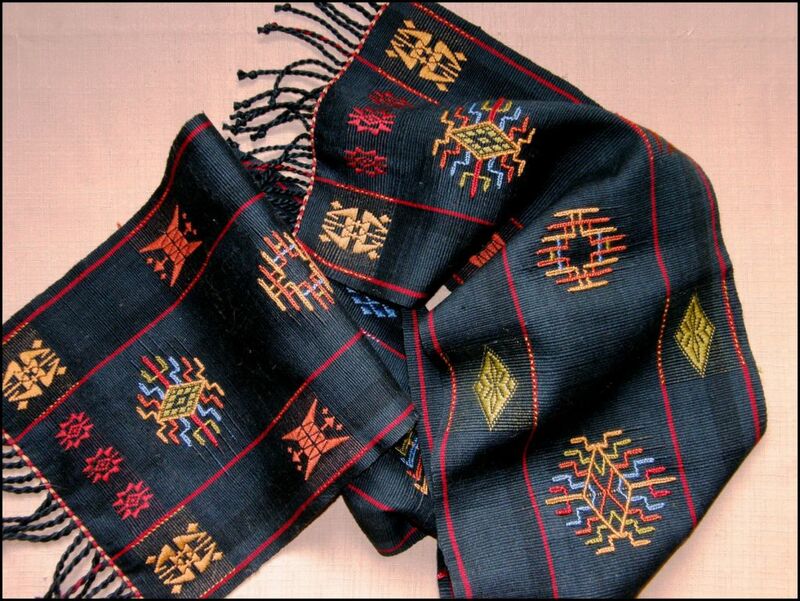 The complementary-warp patterns are ones from Chinchero which I charted in my second book. 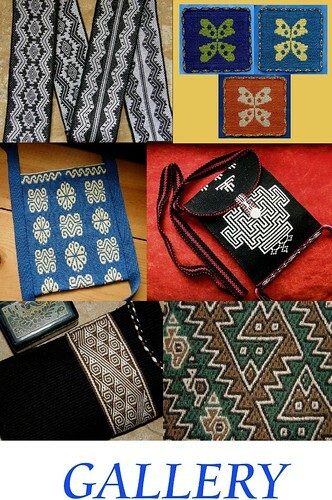 Given the very hardy nature of hemp, I am thinking, as I sit here writing this, that I might use mine for the strap of a computer bag that I have been planning. Excuse me while I go fish the hemp out of the closet and toss it onto the bedroom floor! I won’t be using it for a weft inlay project, though. And fr. Kyriakos wrote to me today and gave me a brilliant idea for it which has a suitably Australian theme….thank you! Meanwhile, before I get too carried away with projects yet to come (well, it’s only natural with the coming of the new year, isn’t it?) there is still something on the loom which needs to be finished. 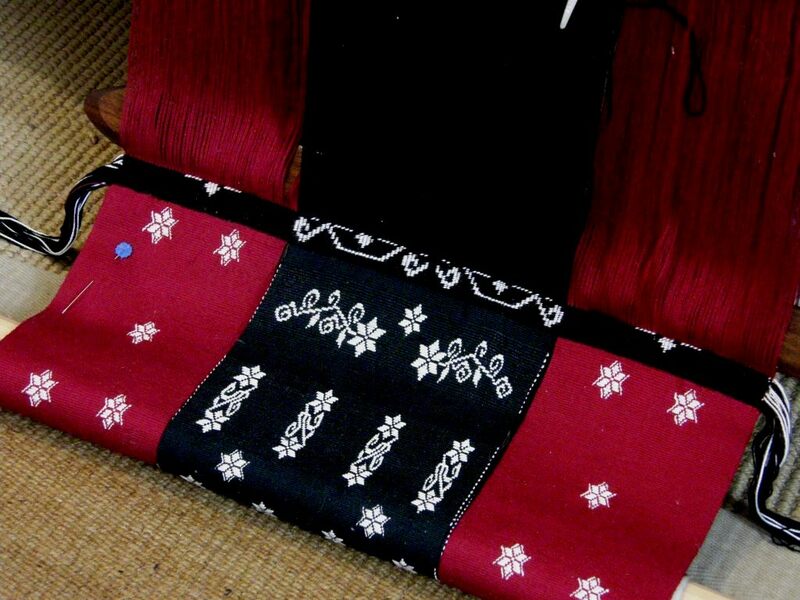 I said that I had finished the weft inlay part of the wall hanging project. You could see in the first image at the top of this post that I have now set up the three finished panels on the one backstrap loom. Now I need to join the panels by twining across the top of all three at once. So, here you can see the twining underway. Oh my gosh, I had forgotten how SLOW weft twining can be! Thank goodness that muscle memory kicked in and I didn’t have to really refresh my skills. It’s been a while since I have done any major twining. The good thing about it is that this pattern doesn’t need any significant amount of concentration. As I said, muscle memory took over and, after the first row of pattern was in place, the counting was pretty much over and I could put on some music and sing and twine away. 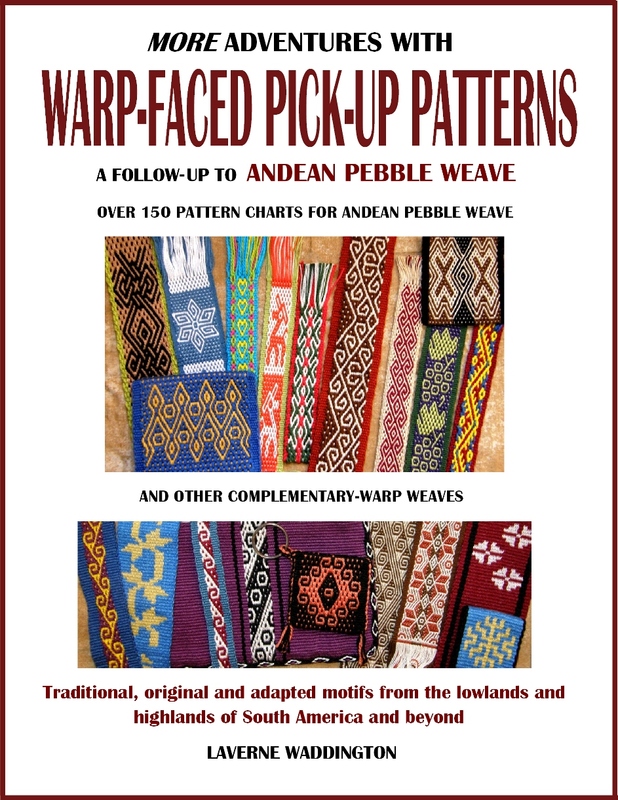 Tanka ch’oro and Andean hook patterns. Muscle memory… such a handy thing. 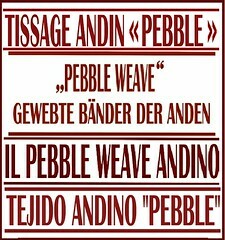 I never really believed that muscle memory would play a big part in pattern picking until I wove twenty-five tanka ch’oro bands in succession before the ANWG conference last June. There would be times when my mind was reading the pattern and telling my fingers what to do yet I knew that something was wrong because it just didn’t feel right. I was actually picking the right colored threads in the right order but, because a distraction had caused me to form my picking cross backwards, my fingers were not picking in the way in which they had become accustomed after so much repetition. I was amazed at how my fingers had memorized the moves and could immediately sense that something was wrong. 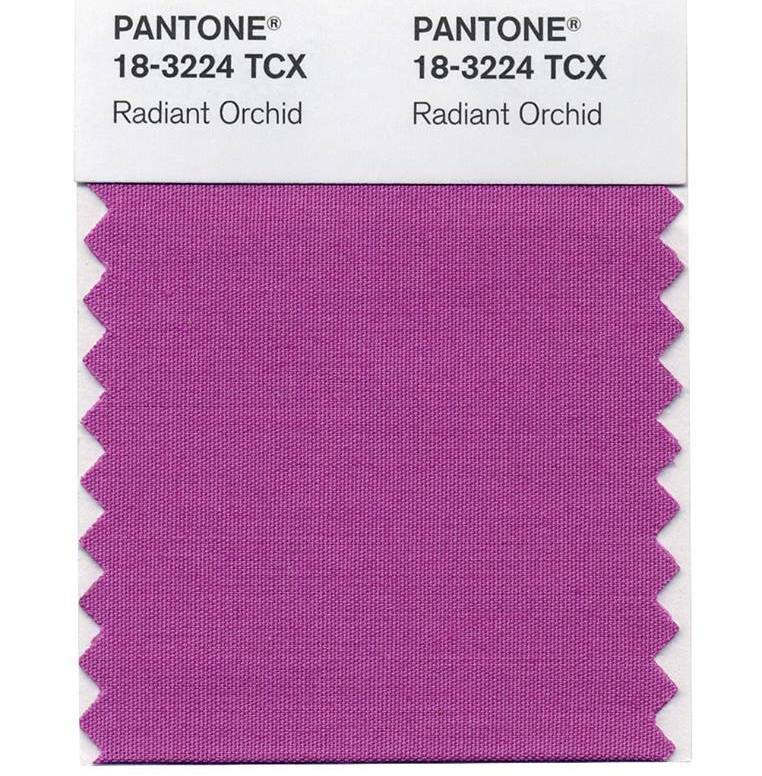 As I sit writing this post, a quick sidetrip to Facebook tells me that Radiant Orchid has been announced as the color of 2014. Who decides this and what does it all mean? Shock and horror…none of my planned projects included this color nor do I have any yarn this color in my closet. Oh well, I guess I get to pass another year hopelessly out of fashion 🙂 It is a gorgeous color, though. 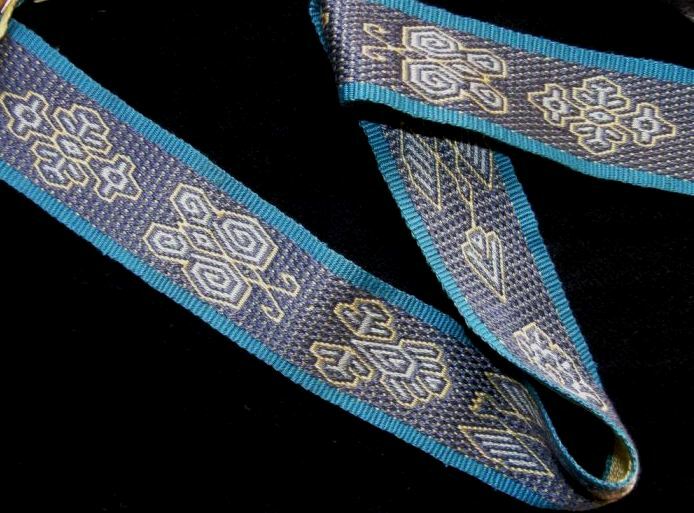 I will leave you here with an image of a textile from the website of the Metropolitan Museum of Art in its current exhibit entitled Interwoven Globe- The World Textile Trade – 1500-1800. (Thanks to Jaina at Wovensouls for making me aware of this exhibit and the fact that it can be enjoyed online). 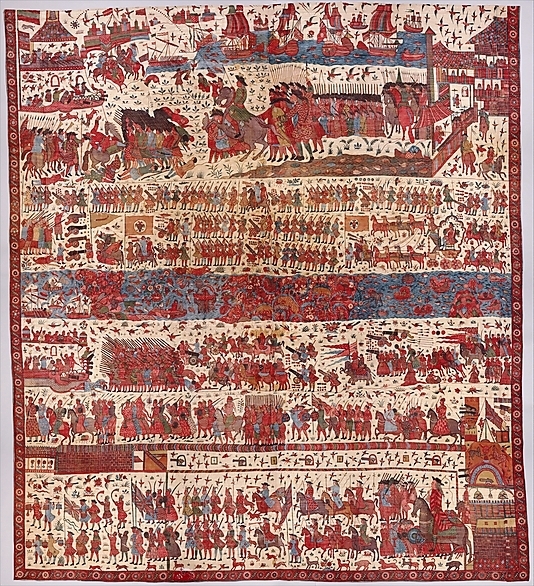 This cotton piece is labeled Hanging Depicting a European Conflict in South India and is dated before 1763. 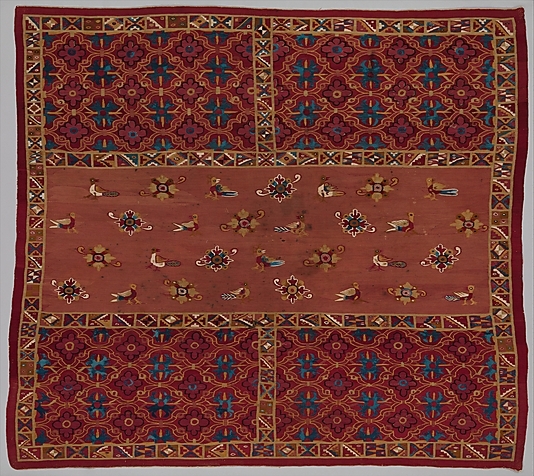 It is fascinating to me to see a textile depicting something of India in this time period. Some distant family members of mine in England have been tracing our family tree and have gone back as far as my great (x6) grandfather, Pierre Gallyot de la Vilette, who traveled from France to Pondicherry in south India to take up a post as a public notary around 1766. 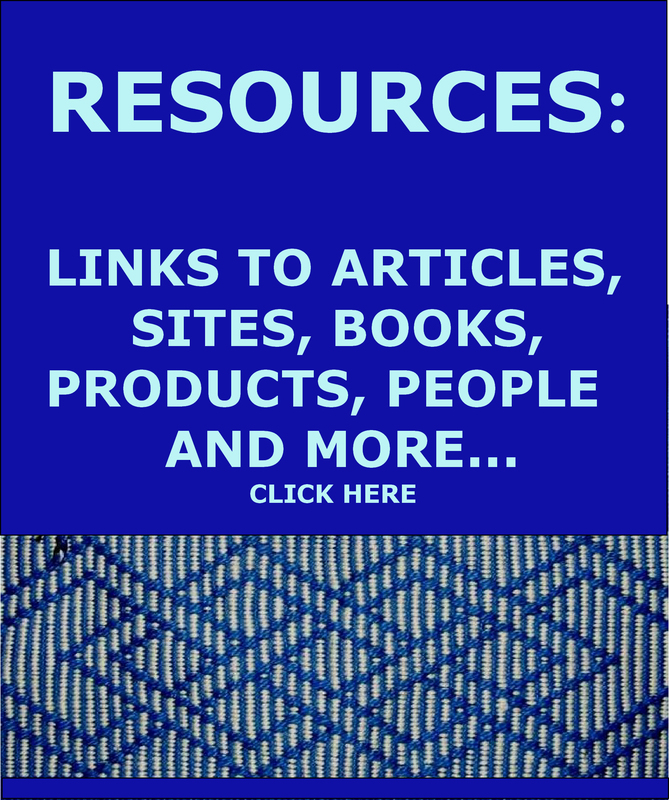 Take a look at the site and enjoy the exhibit!